Google is constantly evaluating its products so it can break your heart by killing the services you love. How dare they? The most recent product to fall victim to a tyrannical "management decision" is My Tracks. Google will shut down the service on April 30th, and the latest app update makes sure you know it. My Tracks is a GPS tracking app aimed at runners, hikers, and other outdoorsy folks. It tracks your location, speed, elevation, and distance. Users can review the data later, save it for use in apps like Maps, and share to social networking sites. 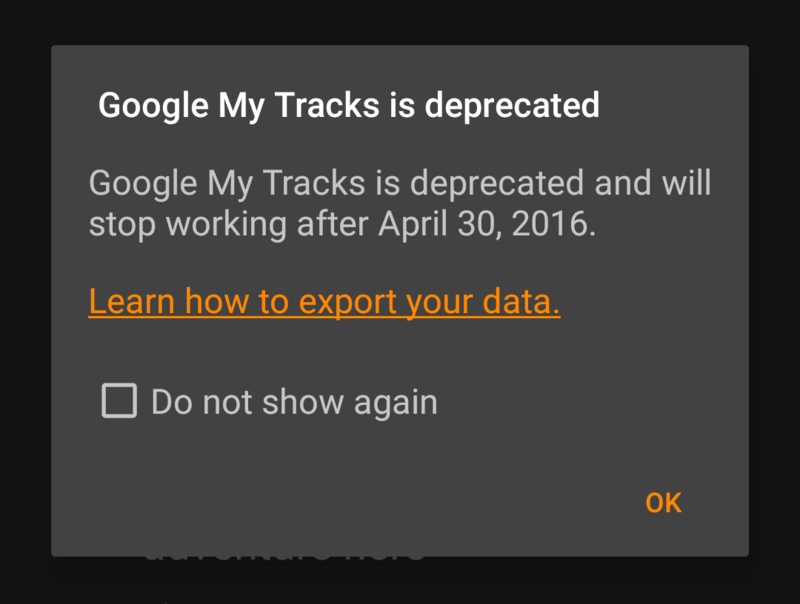 The warning that pops up when you launch the new version of My Tracks links to a support article that will help you export your data via the app before the April 30th shutdown. You can send the data to Drive (which I'm pretty sure Google won't be shutting down any time soon) or download the files and keep them elsewhere. Google also recommends some apps that offer similar functionality like Google Fit, Strava, Map My Run, and Endomondo. You can still use My Tracks normally for the time being, but it's time to start looking into these alternatives.